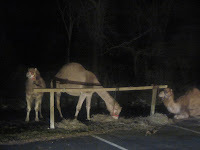 A very special THANK YOU to the Leesburg Church of the Nazarene for the Live Nativity event my family enjoyed tonight! This is our first time attending it, but, I hope it becomes an annual tradition. 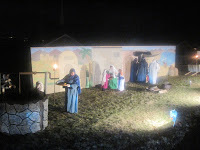 The outdoor event is a drive through "theatre" of sorts, with eleven separate scenes depicting the biblical story of the birth of Jesus in a manger. 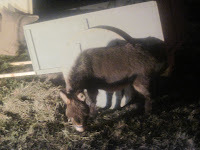 The scenes are acted out by more than 100 actors, and live animals including donkeys, sheep and camels. There is no cost for the event, although as you exit, they will accept donations (not ask for them, and not "suggest" donations, accept them, should you feel inclined to offer something). It is a very nice event, tons of effort goes into this, and I know they have significant costs.... and I am happy to support it. We simply didn't have much cash on us tonight (and no one made us feel bad about it), so I plan to send a check. Not only is the event truly free, but they handed out programs and CDs to each car. I haven't investigated what they gave us, but it is the thought that counts, and so I appreciate it. Again, thank you to the Leesburg Church of the Nazarene. The community clearly appreciates your efforts! What a wonderful event! * The address (for your GPS) is 17667 Roxbury Hall Road, Leesburg, VA; but if you are on Rte 7 about 1/2 mile west of Leesburg, you can't miss it - look for the traffic signs, cones and police directing cars. * To avoid frustrations, plan as if you'll be on a trip for a while. Put little ones in their PJs and bring blankets, pillows and entertainment (DVD, snuggle buddies, whatever works). We brought fresh baked cookies and hot cocoa and listened to Christmas music on the radio (thanks WASH FM - 97.1) while we waited. * I gathered from the signs they allow you to line up beginning at 4:30, we left Leesburg at about 5:30 and returned home shortly after 7. * You can only get in the line from the East bound lanes on Route 7 (and trust me, you can't miss it). If you are coming from Leesburg, all the left turn options are blocked. You'll need to take the exit for Route 9 (on the right), and then make a left off the exit, cross the bridge and make another left onto Route 7 East before you can get into the line. 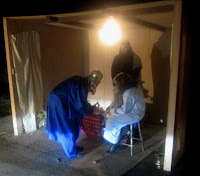 Then, relax, turn up the tunes and enjoy the cocoa, you'll be seeing angels soon! Again, despite my warnings about the traffic, don't let it deter you. It is a wonderful event, and I hope to be back next year.